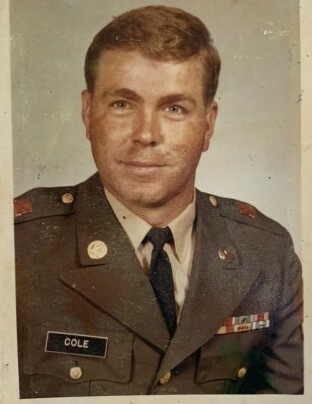 MSG (Retired) Carl Cole, 71, of Radcliff, KY passed away Monday, December 3, 2018 at Kindred Hospital, Louisville, KY.
Mr. Cole was retired from the United States Army having served two tours in Vietnam. He was also retired from Civil Service, Fort Knox, KY. He was preceded in death by one brother, Glen. Survivors include: His loving wife of 49 years, Judy Stone Cole of Radcliff, KY; two daughters, Dawn Richlie & her husband, Michael of Brandenburg, KY, Laura Durham & her husband, Tony of Vine Grove, KY; five grandchildren, Tylaer, Danielle, Kaylie, Allyson, Logan; one great grandson, Thomas; six sisters, Elizabeth, Helen, Geraldine, Wilma, Juanita, Maxine; and a host of extended family & friends. Visitation will be from 5:00 PM until 8:00 PM Thursday and from 10:00 AM until 1:00 PM Friday at the Chism Family Funeral Home, Vine Grove, KY.
Funeral services for Mr. Cole will be held at 1:00 PM, Friday, December 14, 2018 at the chapel of Chism Family Funeral Home, Vine Grove, KY. Burial will follow in the Kentucky Veterans Cemetery Central, Radcliff, KY with military honors.